I'm testing a new reading progress update format. This post will be updated and re-posted with a new date and time with each new short reading update, if I have any. The most recent updates will be added to the top each re-post. Any longer, essay-length reading updates will be separate posts and linked within this collective reading update post. 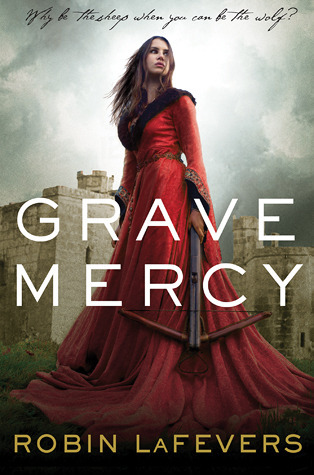 A full review of Grave Mercy will be linked below when I post it. "Not all men are the same, you know. With someone such as Gavriel, I would suggest appearing aloof, not chasing too much. He might see that as suffocating rather than charming." Her words are sharp, but her voice is sweet, like honey on the edge of a blade, and meant to be cutting. I comfort myself with the knowledge that if Duval ever feels smothered by me, it will be because I am holding a pillow over his face and commending his soul to Mortain. He is silent for a long minute, so long I think he will not answer. When he does, I wish he had not. "Doesn't it worry you, that you understand nothing of how they make their decisions? What if they make a mistake?" "A mistake?" My cheeks grow hot at the suggestion. "I do not see how they can, milord, since their hand is guided by the saint Himself. Indeed, to suggest such a thing reeks of blasphemy to me." "It is not the saint I doubt, demoiselle, only the humans who interpret His wishes. In my experience, humans are all too fallible." You know, I don't think it ever occurred to me how evil the Reverend Mother sounded when she's scheming the way she is. And how... manipulative... since she attributes everything she wants done to "Saint Mortain's will." I mean, who's ever able to question that kind of religious logic? 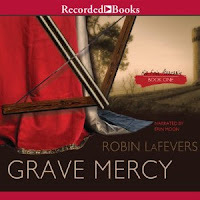 I'm doing a "reread" of Grave Mercy as an audio book to refresh my memory of this series since I'm planning on reading Dark Triumph and Mortal Heart for my Reading Assignment Challenge this year. Let's see if it's as good as I remember it!